Are you ready for a whole new breed of party? That’s what Ghostbar at the Palms is offering with dayclub party with available guest list and bottle serivce. You’re in Vegas; why wait for the sun to set to get your party on? At GBDC you’ll get all the energy of the famous Ghostbar nightclub, starting in the early afternoon! Starting at 1pm, you’ll be joining the hottest day party on The Strip on our guest list. Piñata-smashing, champagne showers, confetti raining down and go go dancers on stilts: welcome to Ghost Bar Day Club! “GBDC” is the Saturday day party at Ghostbar that puts all others to shame. An “anything goes” type of party, GBDC that encourages costumes, debauchery and all that falls under the category of fun. GBDC is a quintessential Las Vegas celebration of a Saturday afternoon as only the Palms Resort can do. What isn’t part of this midday bash? Club goers are hyped to dress up in outfits that are quite contrasted from the stylish ensembles expected of a nighttime party. Tutus, eccentric hats and sunglasses, or rave gear: you name it, you will see it being worn at GBDC! Beer bongs, confetti cannons, and high-energy music being spun by both resident and guest DJs make this crazy atmosphere swirl with vivacity. Go go dancers perform on the bar, platforms on the patio, and walk through the crowd on stilts. The piñata is smashed open at some point during the height of the party, which cranks the excitement up to an even higher level. 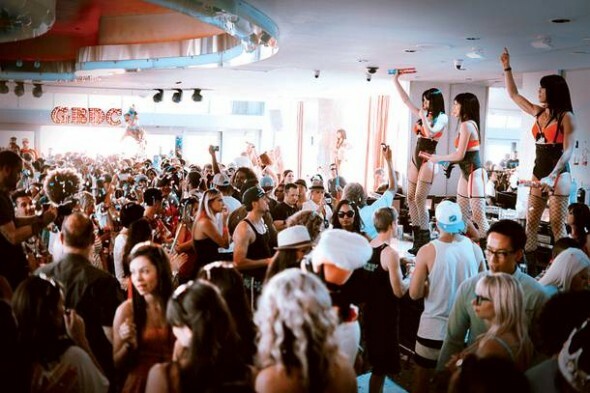 Whether downing a beer bong, being part of the crowd getting sprayed with champagne, enjoying bottle service, or dancing outdoors on the fabulous patio of this venue, GBDC is the perfect excuse to let loose and glorify being in Las Vegas, being an individual, and having a great time. What better way could there be to spend the day but letting loose 55 floors above Sin City at this wild, weekly event? Try not to smile when confetti blasts into the air overhead. Glitter and skin flash equally throughout the club, drawing your gaze to all the best eye candy. When you’re ready for some real candy, head over to the piñatas — but don’t be too surprised when instead of a Snickers bar you find yourself picking up one-of-a-kind party favors or gift cards to The Strip’s best restaurants and shops. Enjoy the Sky-Deck, a rooftop deck offering a 360 degree view of The Strip. If you’re not feeling too tipsy, step out onto the famous Ghostdeck, a glass-inset area of its floor which lets you see straight down to The Strip, 55 stories below. Even inside the main club, you’ll see why Ghostbar lives up to its name; most of the walls are floor-to-ceiling picture windows, making you feel like the building itself is hardly there at all. Once we grow out of kid birthday parties, grown-ups don’t get a lot of daytime partying. GBDC Las Vegas definitely takes that on and makes you wonder why you ever stopped. Ready to experience the hottest day party on The Strip on our guest list or with bottle service? There’s no need to pay top dollar and join the eager crowds in the GA line. Skip the worst parts about clubbing and get straight into the party with Free Vegas Club Passes. Our Ghostbar Dayclub VIP Entry Guest List ensures you won’t miss a minute more daylight than you have to & our discounted bottle service options are the best. Arrive 1pm-3pm and say “Chris Hornak’s List” to get your Ladies in for free and everyone past the GA line! Call or text us at 702-518-2582 to get on the Guest List!